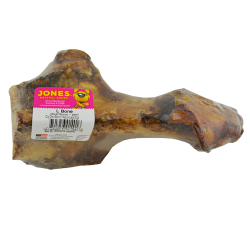 This L Bone is the beef funny bone, but there is nothing funny about the delicious meaty tidbits and hours of chewing this bone provides. Our natural L bone is the elbow of a USA grown and made beef. It is dipped in liquid smoke and oven baked with no artificial ingredients.